Like all members of the Cestoda, T.solium lacks a digestive system, and feeds by absorbing nutrients (in the form of carbohydrates) from the digestive system of its host across its membrane. This requires T.solium to maximize its surface area: volume ratio. T. solium has adapted in several ways to accomplish this goal. 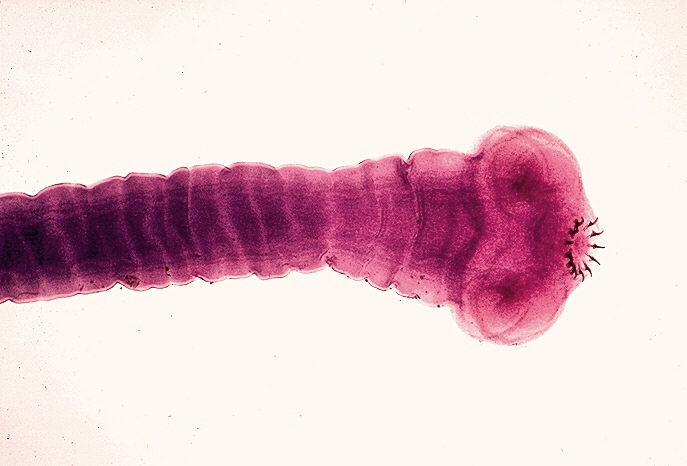 The tapeworm has a flattened body, which maximizes the area available for nutrient absorption while minimizing the volume these nutrients must travel to reach each of the organism’s cells. Cestodes also have microtriches, which are tiny projections that cover the entire body. These serve to increase the surface area even more. Another way T.solium gains nutrients is through secretions which make the digestive system more acidic. The lowered pH helps T.solium be more efficient at absorbing carbohydrates. The adult tapeworm can survive for years within the human digestive tract, due in part to its ability to obtain all of its nutrients from our digestive system.